Coming fast, Mother’s Day 2018 is May 13th this year. So this time begin Mom’s special day with a Mother’s Day lobster brunch of homemade fresh Maine Lobster Benedict, a beautiful dish that is sure to make your Mother’s Day celebration very special indeed. As we like to say, flowers are great, but a Mother’s Day gift of lobster just tastes better. The Maine Lobster Benedict recipe begins with fresh Maine lobster. 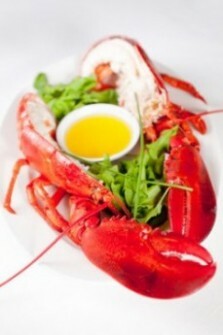 You will need five one-pound lobsters to garner 1 pound of cooked lobster meat. You steam the lobster as usual and use a large chef’s knife to open the claws and tail to remove the meat. Of, if you prefer, you can buy one pound of freshly cooked Maine lobster meat. Just make sure the lobster is fresh. Melt the butter in a double-boiler on top of the stove. In a small bowl, whisk together the egg yolks, lemon juice, and cayenne pepper. Whisk the egg mixture into the melted butter, stirring constantly over heat until the sauce starts to thicken. Season to taste with sea salt. Remove the double boiler from the heat and keep the sauce warm over the hot water. Split and toast the English muffins and place 2 halves on a plate. Cut the steamed asparagus spears in half, and place 3 halve-pieces on each English part of the English muffin. Briefly sauté the pre-cooked lobster in 1 tablespoon of butter until it is heated, and add a portion of the heated lobster to each English muffin. Poach the eggs and top each muffin half with a poached egg. Add a dollop of the Hollandaise Sauce on top. Note on the Hollandaise Sauce from Chef Tom Gutow: If the butter fat and egg yolks separate and the sauce appear to curdle, add a few tablespoons of hot water from the boiler and whisk like crazy to emulsify it. This will make the sauce smooth again.